Is your sports hall netting, gymnasium netting or canvas screening old, damaged or falling apart? sportsequip supply and/or install specialist trackway netting and canvas screening in sports venues across the UK. Whether you're looking for standard netting or a more bespoke, tailored netting solution, we're happy to help. We supply indoor cricket nets, tennis and archery netting, divider nets and sight-screening materials/nets. All of our netting is fire retardant in compliance with BS 5872. When retracted, nets can be stored in heavy duty, fire retardant PVC bags to keep your sports hall tidy and to prevent nets from interfering with other activities. Our in-depth knowledge of UK netting manufacturers and their products, enables us to offer expert advice and guidance when your netting appears to have reached the end of its useful life. Many companies will advise that in addition to any netting required, that new trackways and runners be replaced at additional cost and inconvenience. That is certainly not always the case. At sportsequip we try to see things from the customers' perspective offering practical solutions to problems at cost effective prices. If you only require new netting, we will supply new netting. If you'd prefer your new nets to be fitted, we can do that too. If you would simply like advice on how a different netting products or configurations might benefit you, we are happy to help. Our full range of sports netting and canvas screening is made to order, ensuring our nets and screens fit perfectly each and every time. Prices for replacement sports hall netting will depend upon both the works required and/or the extent of the products and services supplied. Standard guide prices for these services are therefore unavailable. 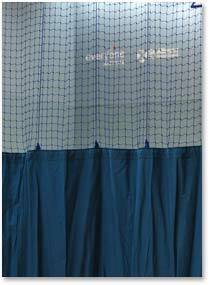 For cost efficient, indoor sports netting system solutions, think sportsequip.